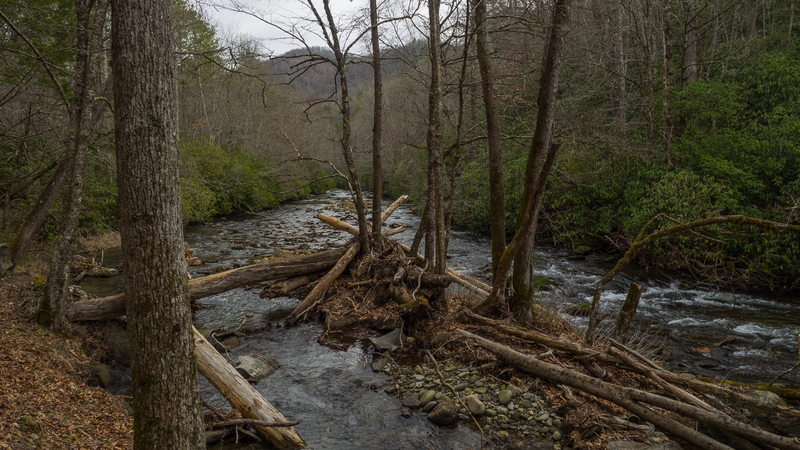 Deep Creek is one of many popular recreation areas found in Great Smoky Mountains National Park. Camping and picnicking are in abundance, as well as plenty of waterways for fishing and tubing. The assorted hiking trails also make it a fun destination for you and me. This hike, a combination of two different small loop trails affords the opportunity to visit the three famous Deep Creek waterfalls, to explore the nearby forest, and to follow the refreshing streams that flow through the area. Ken and I visited Deep Creek on Tuesday, February 28, 2017 beginning at 8:30AM and ending about 12:15PM. Our plan was to take the Deep Creek Trail to its meeting with the Loop Trail, hike over the mountain to the Indian Creek Trail, then join the Deep Creek Horse Trail for its journey past Juney Whank Falls and the return to the start. Hike Rating: Moderate. Most of the hike is fairly easy, but there are steep climbs on Loop Trail and Horse Trail. Trail Condition: Very good. Most of this hike is on double track forest road. Loop Trail is single track, but with minimal obstructions. Starting Point: At the terminus of Deep Creek Road, across from campground. Trail Traffic: There were half a dozen other hikers out on this delightful day. How to Get There: From the intersection of Hwy 441 and Route 19 in Cherokee, NC, drive 10 miles south on Route 19 to Everett Street in Bryson City. Turn right onto Everett and drive 0.2 miles, and then turn right onto Depot Street. After a short distance, take a left onto Ramseur Street and then an immediate right onto Deep Creek Road. Drive 2.3 miles to the Great Smoky Mountains National Park entrance, and then another half-mile to the parking area for the Deep Creek hike. Deep Creek Campground at the entrance to the national park was the home of the Civilian Conservation Corps from 1933 to 1936. While there, they constructed several trails in the vicinity including this one, Noland Divide, and Thomas Divide, all of which are more than 12 miles in length. Parking for this trailhead is located just across the creek from the campground, at the end of Deep Creek Road. The trailhead is right alongside Deep Creek. It is then a short 0.2 mile stroll on wide gravel road to the first feature, picturesque Tom Branch Falls. This 80-foot waterfall is on the hillside across Deep Creek, at the point where Tom Branch plunges into the creek. The waterfall is broken into several separate shelves, creating a wealth of splashy cascades. Interestingly, when the water flow is low like it was on this day, it switches from side to side as it crosses the ledges. The Park Service has placed several benches for anyone to just sit and enjoy the view. Tom Branch Falls is especially lovely when the surrounding forest is alive with color in Autumn. As you continue along Deep Creek Trail you’ll cross on scenic foot bridges enabling the opportunity to peer up and down stream. During late summer, early fall this trail is lined with hearts-a-poppin’-with-love wildflowers, sometimes known as strawberry bush. It’s about a half mile of easy, level strolling alongside the creek to the junction with Indian Creek Trail, what will later be the end of your first loop. For now, continue straight ahead on Deep Creek Trail. Not far beyond the junction you will cross another foot bridge, this time over Indian Creek, then come to another junction. You will take a right turn up the hill to continue on Deep Creek Trail, but this is also where you will eventually return to take the left fork to begin the second loop of this hike. After topping a short rise, the forest road stays alongside Deep Creek, now a series of mostly still pools interspersed with occasional shoals. Deep Creek is also filled with the very common Smokies moss covered rocks. This is a nice wet playground for kids to cool off on a hot summer day. This long straight stretch of Deep Creek is characterized by shoals interspersed with still pools and the occasional log jam..
At the end of the long straightaway on Deep Creek Trail you will make one more crossing of the creek on a foot bridge and come to the junction with what is simply called Loop Trail. Deep Creek Trail itself continues many, many miles farther into the Smokies backcountry. However, for this hike take Loop Trail to its meeting with Indian Creek Trail one mile away. We were surprised to see blooming forsythia along the trail. Surprised, one, because forsythia is obviously not a native flower to the Smokies, and two, because it must have been brought here by a settler. We looked around for a foundation or remnants of a homestead, but could not pick one out. The blooms in late February were a nice treat. Loop Trail begins a steep climb almost immediately, gaining 440 feet over the next half mile. Between your huffs and puffs, enjoy a forest of white pine, sugar maple, eastern hemlock, and in late April-early May, flowering dogwood. Trails crew work is in evidence along the way, with water bars and stairways strategically placed to prevent erosion. At the top of the ridge, at the halfway point, Loop Trail meets Sunkota Ridge Trail, another of the many that head deep into the Smokies backcountry. Ah, another hike for another day. Just as steeply as you climbed, you will now drop down the other side to the Indian Creek drainage. This area is a delight in spring, with an understory of dogwood and mountain laurel. The forest is beautiful (the picture up at the top of this post was taken here), with nice viewing of the surrounding mountains when the leaves are down in winter. Soon you will come to a spring on your right side that will become a small creek carved through a narrow ravine as it trickles down the steep hillside. As you near the junction with Indian Creek, you will hear the sounds of cascading water before you see it. For this loop, turn right on Indian Creek Trail. For future consideration, if you were to turn left, you can go to the Deeplow Gap Trail, and eventually on to Martins Gap Trail to undertake a very large loop that meets the far end of Deep Creek Trail. For its entire length Indian Creek Trail is an old roadbed that is now used by hikers, horses, and perhaps surprisingly, by mountain bikers. Deep Creek and Indian Creek are two of the very few trails in the Smokies to accommodate mountain bike riders. Soon, you will reach a junction with Stonepile Gap Trail, a means of accessing Thomas Divide. But continue on just a short way, crossing a bridge over Indian Creek, then you will hear the rushing sound of Indian Creek Falls. This angle of Indian Creek Falls, from above, belies the picturesque nature of its cascade. Especially during times of high water flow, this one is perhaps the most attractive of the major waterfalls in Deep Creek. Look for another photo of Indian Creek Falls in the gallery below. A mere 200 feet after passing Indian Creek Falls you will return to Deep Creek Trail for the end of the first loop. Take a right, cross over Indian Creek, then reach the beginning of the second loop, this time a left turn onto Deep Creek Horse Trail. We passed by another stand of forsythia, then crossed a footlog over a small branch. You now have a decision to make. Turn left to take the Horse Trail, or go straight ahead on an unnamed manway that climbs up, up, up to eventually meet the Noland Divide Trail. Ken and I thought we would explore this manway for a bit since we still had plenty of time. We went up 360 feet in little more than a quarter mile, gasping for air most of the way. Instead of leveling out, this pathway just kept getting steeper and steeper. We decided enough was enough and turned around. The Deep Creek Horse Trail was up too, but at least on a more modest grade, climbing only 260 feet to the top of the ridge. The forest along the horse trail is another beauty, filled with beech and maple, among the many hardwoods. After topping the ridge you begin descending to a meeting with the Juney Whank Trail. This Cherokee phrase roughly translates to “place where the bear passes.” Juney Whank Falls is an 80 foot cascade with a foot bridge crossing about half way up. From the bridge you look up for the top half of the falls and down for the bottom. It seems a little whanky, shall we say, to put the bridge right in the middle rather than at the bottom. Oh well, that’s my photographer’s brain working. The good news is the bridge puts you close enough to touch the water. There is a very comfy bench on the foot bridge that made a great place for Ken and I to enjoy lunch and the splashing cascade of the waterfall. As we were almost finished with this hike, it was a fine end to what had been a glorious morning. After nourishing ourselves we continued down Juney Whank Trail the final 0.4 mile back to the trailhead parking area. In summary, this is a great double loop hike with a little something for everyone. 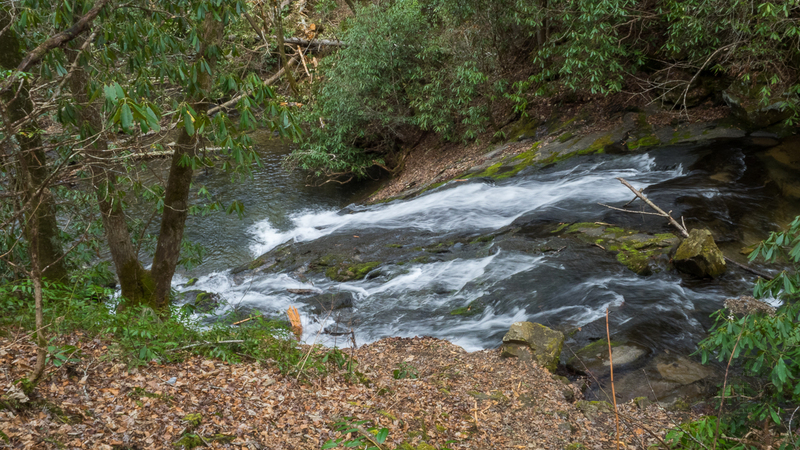 If you’re out for a stroll with the family, there is plenty to do along the creeks, and waterfalls to enjoy. If fitness is your cue, then the climbs on Loop Trail and Horse Trail will fill your bill. These loops offer the best of the Smokies that includes stunning forest, ubiquitous waterways, even grand views of the majestic Great Smoky Mountains. What’s not to like?